This is Fun Number Matchsticks Puzzle for Kids. In this Matchstick Picture Puzzle, you are presented with number equation made using matchsticks. Your challenge is to move only one matchstick and make the given equation correct. 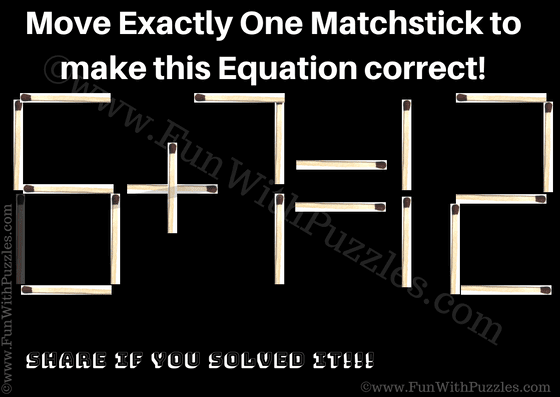 Post your time to solve this Number Matchstick Puzzle in the comments section of this post. 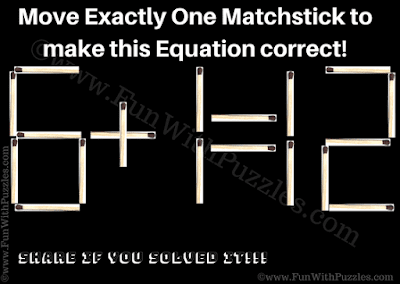 Can you solve this Number Matchstick Puzzle? Answer of this "Numbers Matchsticks Puzzle for Kids", can be viewed by clicking on button. Please do give your best try before looking at the answer.